Hephaestus | Learn about Greek Mythology,Greek gods,Greek mythology stories! 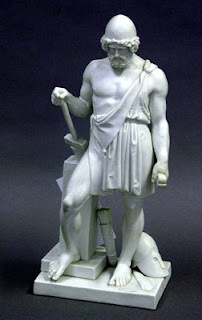 Hephaestus is the god of fire and metalworking in Greek mythology. He was the son of Zeus and Hera. This refers at the Homeric verses, which were followed by later writers. However, Hesiod presents the god as the child of Hera only, who was born with parthenogenesis without the involving of a father.Borned ugly and distorted,but his mother Hera was shamed so she, threw him from Mount Olympus.The god-infant fell into the sea, where he was collected by Thetis and Eurynome,they raised him for nine years. Once the god grew up, he immediately erected his first ironworks in the depth of the Aegean sea, hammering there beautiful objects for these two deities. One day, Hera, envious of the jewelery of Thetis the Nereid asked them about their origins, and when she discovered that they were crafted by the son that she had despised, she went, took him and brought him back to the mountain of the gods. There, she offered him a blacksmith with 20 bellows and gave him as wife, the beautiful Aphrodite. There is also another version,about the return of Hephaestus at the picks of Olympus, according to which he sent a gift to his mother, a unique art throne, when she sat on it she got trapped automatically by invisible shackles and forced to seek the help of the despised son to be released. In the Iliad, Aphrodite appears to cheat Hephaestus with the charming Ares on the marital bed, but one day,unawared they got caught by the ugly but also clever god of fire ,trapping them in a thin gold net and then expose them in front of all the other gods . Hesiod, however, displays as a wife of Hephaestus Aglaia, the youngest of the Graces. 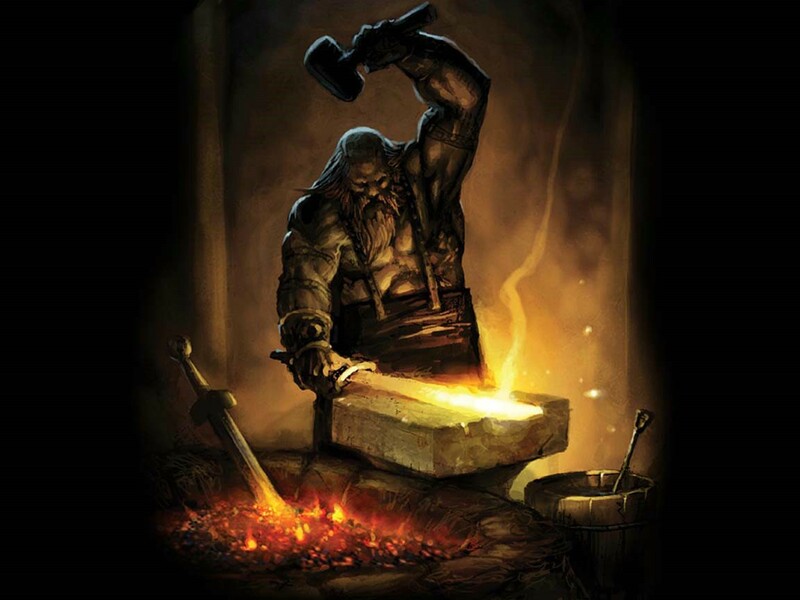 In a later incident, Zeus threw god-blacksmith from the god's residence because he was rushing to help Hera when she was hanging from the celestial vault, grounded for the storm she had sent against Hercules. This time, the fate of Hephaestus was to fall into shore on the island of Lemnos, where he was found by the Sintis at the evening, exhausted and broken both his legs from falling on the hard ground. The care and the hospitality of these poor people made ​​ their island the favorite place of God on earth of mortals. There, on Mount Mosychlos, he recreated, his permanent this time workshop. There he will create many exquisite objects which were ordering the gods, and weapons for some people. Among the crafts of Hephaestus stands out the clay woman, Pandora, whom Zeus gave to Epimetheus as a wife in order to avenge the insult that had done by his brother Prometheus, when stole the fire. The name of Hephaestus was given to the "volcanoes mountains," currently known in geology as volcanoes, which in turn baptized and the whole industry, the Volcanology. It is obvious why,people imagined that beneath a mountain from which derived smoke, fire and more sonorous sounds,a god had his forge. For the same reason, except Mosychlos (which for centuries was emitting fumes), other versions want the forge of Hephaestus to "conceals" in other volcanic places, usually in Etna, Mount Vesuvius or the Aeolian Islands.